GoPro Omni 8K 360 camera rig is now available for half of its original cost, at just $2500 for a complete set (including Autopano Video Pro stitching software). Should you get one? In this post, I discuss its pros and cons. Back in January, GoPro dropped the price of the Hero5 and Hero6 by $100 each. One consequence of their sudden price drop was the cascading effect on the price of the Hero4 and Hero4 Black, which in turn is probably one of the reasons some retailers have slashed the price of the GoPro Omni (which uses the Hero4 Black) to half of its original cost. Suddenly, with a price that is now similar to a full frame DSLR (as opposed to two DSLRs), this popular 360 camera rig has become much more affordable and accessible to many more 360 shooters. In this post, I discuss the advantages and disadvantages of the GoPro Omni in 2018. Please note this is not a hands-on review because I don’t have a GoPro Omni myself (although I do have a Freedom360 GoPro rig with six Hero5 Black cameras) so the information here is secondary information, not personal experience. GoPro Omni is comprised of six GoPro Hero4 Black cameras in a dedicated rig. Note that the Hero4 Black has the same sensor as the Hero5 Black, and is therefore only one sensor generation away from the latest Hero6 Black. The Omni has two variants – the lower cost one is a rig only. This post will focus on the complete set which includes the rig, all cameras, a unified battery, accessories, and most importantly, Kolor’s acclaimed Autopano Video Pro 2 and Autopano Giga 4 stitching software, a software bundle that would otherwise cost around (note: Video Pro 2 can be upgraded to Video Pro 3 for EUR269). Image quality: With 360 videos, you cannot rely solely on the specifications in order to assess detail, so not all 8K 360 cameras are equal. In this regard, GoPro Omni is among the rigs with the best detail at this price level. Based on evaluations by Omni users who have other 360 cameras such as the Insta360 Pro, it appears that the Omni is more detailed. Here is a comparison that I found on YouTube. It’s in Japanese but you can see which side is Insta360 Pro and which side is Omni. Workflow: Compared to conventional rigs, the workflow for GoPro Omni is much simpler, thanks to the Omni Importer component of Autopano Video Pro. Normally, using a rig is very tedious when both shooting and stitching. When shooting, you have to make sure all the cameras have functioning memory cards, all of the cameras are charged, all lenses are clean, all of them have a consistent white balance and exposure, and that all of them start recording. GoPro Omni makes shooting a bit easier. First, there is a single V-Mount battery that can power all the cameras, so you only have one battery to worry about. You can also easily control all the cameras simultaneously thanks to the GoPro Smart Remote, which you can use to set the same exposure settings, and trigger all the cameras simultaneously (but you should still use some type of syncing sound). Similarly, stitching on a rig is also a huge undertaking. You need to take out the memory cards (physically tedious), and match the videos with each other. In this regard, Omni Importer handles the tedious task of matching the video files with each other. Price: At $5,000, the Omni had many competitors that were more affordable (such as the Insta360 Pro at $3,500). However, at $2,500, the Omni is actually one of the most affordable 8K 360 cameras or rigs available, particularly when you consider that the cost already includes the stitching software. To me, the biggest disadvantage of the GoPro Omni is that it is not upgradeable to the newer GoPro cameras. It can only use GoPro Hero4 Black and cannot be modified to use a Hero6 or future GoPro cameras (given that the last three Heroes have used the same body, it is extremely unlikely that GoPro will revert to using the Hero4 style body). 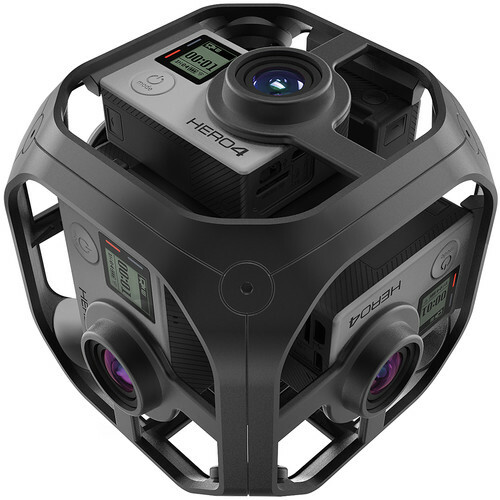 Personally, I went with the option to get a Freedom360-style rig and GoPro Hero5 Black cameras. This lets me upgrade the rig in the future. As for the software, I was really tempted to get Autopano Video for its Omni Importer component. However, Bonsai has said that they are going to make their Arborist software (which is similar to Omni Importer) compatible with other cameras and rigs. So that’s something I will be working on with Bonsai, to make it possible to use Arborist with GoPro Omni / Freedom360-type rigs. And I plan to use Mistika VR for stitching. Meanhile, if you’d like to get the complete GoPro Omni, it’s available at B&H while supplies last. Here’s another one I saw on eBay for $1920, brand new. Look out for even better deals, I saw the Omni on Adorma for $1949 and I just bought the Omni for $1699 + tax from B&H using a promo code issued during NAB. Wow what a fantastic deal! Congrats Brian! Except that when it arrived one of the cameras in the array was not working. I tried change the battery and cards around but not luck. That worried me and after seeing the weight (24Ibs) of the case with all the accessory, external battery and power supply and reading other posts and watching the video link you posted, I realized that the Omni is not good close or even some distance away and the stitching was going to be a lot of work. With all of that I returned for a refund. Think I read you didn’t like Insta360 as well, so if Omni is a no, and Insta360 is a no as well, which is your recommendation for a good 360 level, but not passing the 3k Budget ? is something realistic to achieve ? Have you seen the rumour Xiaomi might buy GoPro? Thanks Roland! I really appreciate the tip!